harvest | Patricia DeMarco Ph.D.
My earliest memories come from growing up in Mt. Washington living upstairs from my grandparents. The back yard was planted end to end with a garden that fed the whole family. We had fruit trees on the borders – pears, plums, cherries, peaches, and of course, fig trees Pop carried here from their home town of Campolieto- Campobasso in Italy. No space was wasted, and the skill of ages went into making everything flourish. I learned from an early age about planting onions among the tomatoes, and putting the zucchini squash and beans in alternating plots each year. The brick walkways had chamomile and thyme growing in the spaces so walking through the garden was a fragrant experience. Mint, chamomile, oregano flowers, and rosemary scented the linen drawers. My grandfather Angelo worked for the Railroad as a skilled stone cutter, laying the rail beds that wound through the city and into the boroughs beyond. He went off in the morning with a lunch box filled with hand made bread, slathered with lard, and filled with the bounty of the season – fresh onions and tomatoes with basil in the summer, dry sausage and roasted peppers in the winter, with all variations in between. As a child , I did not know we were poor because we ate like kings! Of course, it was the labor of days and nights that fed the family. All summer, we put up food in jars, working under the porch in the shade of the grape arbor that grew up to the second floor. Since every house on the whole block was farming as we did, we pooled resources to harvest and can. Three or four women chatted away in Italian as they peeled, pared, pressed and stirred vast vats of sauce over the black coal stove. We went to each house in turn, sharing seasonings and recipes…none written down, just passed on from hands to hands. At the end of the summer, the cold room in the cellar would be filled with hundreds of quarts of tomato sauce, ratatouille, beets, carrots, beans dried and stored, onions and garlic hanging from their braided stalks, roasted peppers stored in oil, eggplant and all manner of pickles. In the winter, we would make salchiche (sausage) and Pop would take a good piece for prosciutto, a five year process of packing in salt and pepper. The new one would go to the back of the line, and the front one would be cut. A special treat in summer would be a curl of the deep red meat over a cold slice of melon. We did not always have meat, but we kept illegal chickens under the porch that supplied eggs, and vast amounts of chicken cacciatore for the gatherings of the extended family on feast days. (My Nona celebrated the saint day, not the birthday of her children.) As I have tried to become less dependent on meat in the diet, I have recalled so many of my Nona’s meals. She made yellow and green zucchini with onions, peppers and tomatoes well seasoned with garlic, basil, oregano and hot pepper to pour over polenta. Or this was served fresh sometimes in the summer, with eggs poached in the broth and big slabs of hot bread. In the winter, the freshness of the summer days would rise from the jar as the canned ratatouille was opened to serve. And nothing beats home canned tomato sauce over hand made gnocchi. I have always put some freshness of summer up for the winter in jars. Partly because I love jam on my breakfast toast, but dislike to the overly sugared and tasteless commercial preserves. 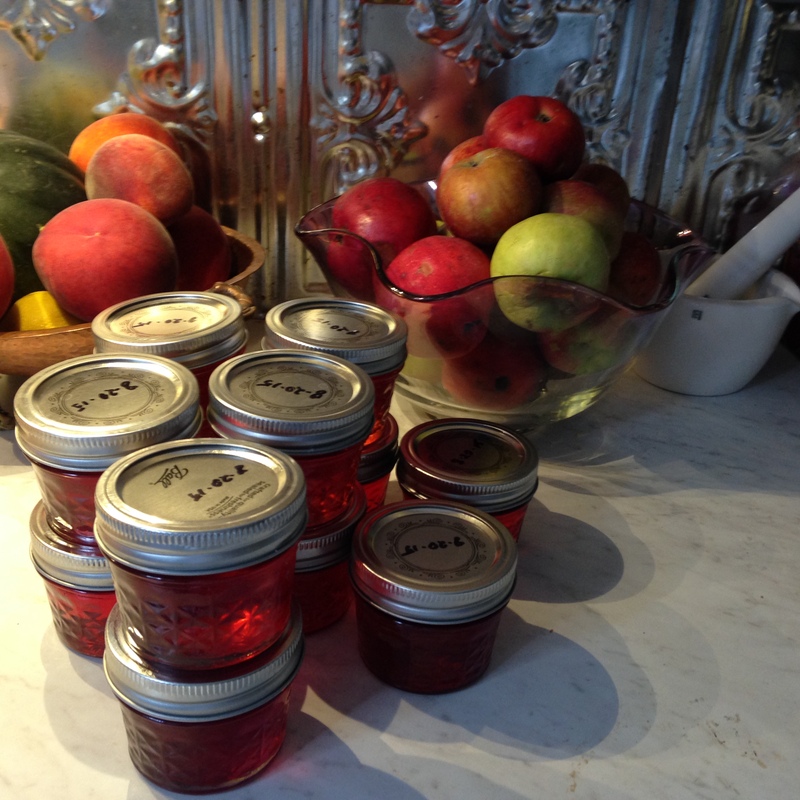 I find that done in small batches of about 12 cups at a time, it is simple and very rewarding to make jam. Strawberries in May, rhubarb, plums, peaches, raspberries, blackberries all find their way to the larder. It is also very easy to put up fresh fruit, especially peaches and pears and applesauce with just a boiling water bath as a processing requirement. And of course, the fresh tomato sauce, ratatouille, beets, carrots, and eggplant come in season. The time is easily found when the reward is so tangible, and adds so much to the quality of life. Though I rely on my CSA from Kretschmann Organic Family Farm for most of my produce to can, I still feel connected to the farming tradition of my family. It warms my heart to share my Nona’s legacy with those I love.